The P26 has a goosneck that is free to slid up and down. Main luff tension is controled by a downhaul. The sail is hoisted all the way (I put a stop at the masthead) and then the downhaul is adjusted as desired. I have a 6:1 purchase on mine which is adjustable from the companionway. 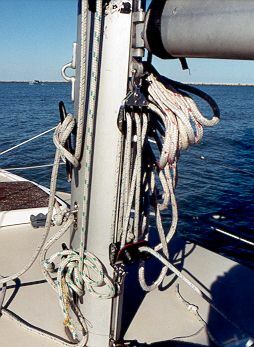 The lower block is attached to a padeye that slides into the sail track on the mast and is through bolted.